Ben has been looking up the passes on the Maratona. For the long course, there are really seven passes, although some minor bumps could be called passes as well. Ben’s comments: a nice warm up pass at a moderate grade with about 1000 vert feet. Ben’s comments: Now we’re climbing! Should be about an hour for Ben to climb at an easy pace, which is what he plans to do so early in the day. However, looks like nothing over 7%, so we should be able to spin up comfortably. We’re talking about 2100 vert feet here. Ben’s comments: Looks like we don’t descend very far from the top of Pordoi before turning the corner to go up Passo Sella. Glad not to drop all the way to Canazei, as the day will certainly be long enough. The one 10% section should give us a good test. 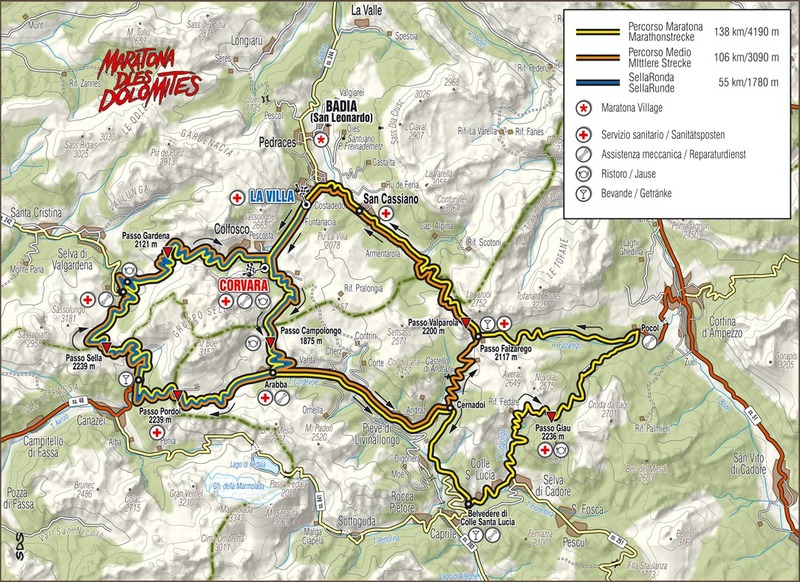 Ben’s comments: Easier grade again for a moderate climb up to complete the last pass on the Sella Ronde. The downhill takes us back to Corvara, the finish line (and through which we will ride on the first few klicks to the first pass.) One can call it quits here, but that is not our goal. See above, although Ben thinks that that easy climb of the morning will be a drain if one is slightly dehydrated or short on eating. Ben’s Comments: One drops to Pocol (almost to Cortina d Ampezzo) off Passo Giau before turning up to Falzarego. At the end of a day, this on one long climb, although only a few sections are over 7%. The top of Falzarego is only a very short way below the neighboring Passo Valparola. Ben remembers this as a short traverse to the head of the drainage to the west, where one then drops down to the drainage to the north.